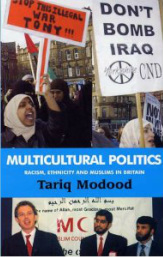 Over the last 20 years I have worked on: theory and politics of racism, racial equality, multiculturalism and secularism, with especial reference to British Asian Muslims; ethnic identities, national identities and the 'second generation'; ethnic disadvantage and progress in employment and education; comparisons within and between Western Europe and North America; the politics of being Muslim in the West. The topics I am currently most focused on are the political theory and sociology of multiculturalism and secularism. I was the Bristol Director of the Leverhulme Programme on Migration and Citizenship, with UCL, which consisted of 8 projects running between 2003-09. With Anna Triandafyllidou I led EMILIE: A European Approach to Multicultural Citizenship (with 8 EU partners), an EU 6th Framework project (2006-09) and we followed this up with a 15 countries project, Accept Pluralism: Tolerance, Pluralism and Social Cohesion (2010-2013). I worked on a project with Dr Therese O’Toole, Muslim Participation in Contemporary Governance, funded by the AHRC (2010-13). During 2010-11 I had a Fellowship from the AHRC to work on a book on Secularism and the Accommodation of Muslims in Western Europe, which I developed further on during my Robert Schuman Fellowship at the European University Institute, 2013-2015.